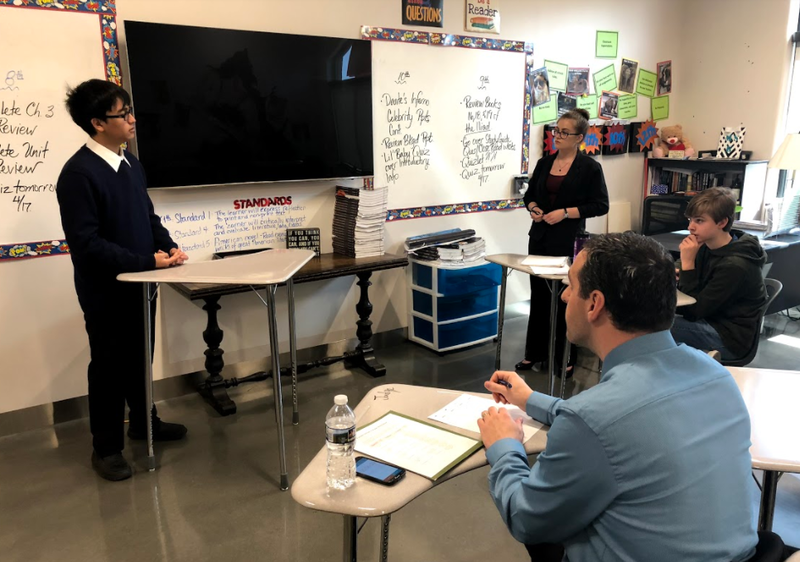 If you are going to be debating in a Luddy Debate League tournament, it will help you to know that the Coolidge Foundation has a distinctive approach to debate. Two important things for you to know about are our debate format and our debate style. In the Luddy Debate League, students debate in teams of two. It is most similar to team policy debate, but with shorter times. The timing and order of speeches is as described below. Please familiarize yourself with it, as it might differ from other formats that you have heard of or seen in your debate career. Debaters should not raise new arguments during rebuttals. Both teams will receive 5 minutes of prep time which can be used when desired between speeches. 1. Content is of utmost importance. While speaking style is important, to be crowned a Luddy Debate League champion, content expertise is most important. Debaters will be judged carefully based on the quality of their arguments and evidence. Debaters should take extreme care to ensure they understand the arguments they are making, and that their evidence comes from reliable, trusted sources. Primary sources, facts and figures from government-published databases, scholarly research, academic articles, books, and other publications are examples of high-quality evidence. 2. Speak at a conventional public pace. Speak clearly and efficiently, and do so at a pace that a layperson can understand. When President Coolidge gave a speech on the campaign trail, a radio address, or made a plea to Congress, he did not do so at 300 words per minute. Your goal should be to communicate your thoughts, not overwhelm the judge or your opponent with the speed of your speaking. Choose the major points that you want to make, and make them clearly. Take the time to define key terms, provide vivid examples, or cite evidence that back your claims. Particularly with constructive speeches, it is better to lay out three to five good points than to make ten or more weak or unsupported points. “Dropped points,” i.e. failing to counter a point made by the other side, is not a disqualifying mistake in one of our debates (though pointing out the flaws in opponents’ arguments is important to success). President Coolidge, a great economizer of words, would want to know what your main ideas are; he would not be moved by superfluous ones. Debate the resolution. Do not radically redefine the resolution, or isolate some small component of the resolution and attempt to win the debate by ignoring other important parts of it. The judges have been informed that topicality is highly important and that debaters who fail to debate the intended resolution will lose the debate round. 5. Don’t fixate on procedural technicalities. We familiarize our judges with basic debating conventions — however, since we make use of citizen judges, it would not be wise to stake your entire case on calling out the minor procedural foul or transgression of an opponent. President Coolidge would expect you to win primarily on the merits of your own arguments, not by your opponent’s mishap. Above all, exercise civility in your arguments and toward your opponent and judge. Just as President Coolidge was more concerned with character and principle than with political expedience or his personal historical legacy, resist any temptation to resort to incivility during your debate. Be incisive, resilient, or even adamant, but don’t be anything less than civil. Relevant arguments are important in this debate league. With that in mind, the Coolidge Foundation creates a debate brief that outlines important and evidence-based arguments for both sides of the resolution. The brief also includes a section with background on the topic and definitions of key terms. Arguments from outside the brief are both permitted and encouraged, but debaters should carefully evaluate the logic of the arguments that they use. Quality evidence is also important in this debate league. Evidence from outside the brief is permitted and encouraged, but debaters should carefully evaluate the evidence that they use, and only use evidence that they genuinely believe is good and reliable. You may ask your opponent about the evidence that he or she is using, but unlike standard high school policy debate, this league does not expect debaters to prepare evidence cards and “call” for them during the debate. Also, debaters are not allowed to bring in visual aids such as posters, handouts, or printed graphs. If there is a graph or diagram that you’d like to incorporate into your argument, practice describing it in words. Electronic devices such as laptops, tablets, and mobile phones may be used as long as they are not connected to the Internet during the round. To ensure fairness, please put your device in airplane mode (i.e., turn off your devices WiFi and cellular capabilities) during the round. Keep in mind that, just as with written notes, the less you handle and read from your screens, the better. Judges will look at heavy reliance upon electronic devices negatively, just as they look at heavy reliance upon written notes negatively.